My children love to bring special treats into the classroom on holidays. Instead of taking in sweets and candy they love to take in a gift like the “Play-Doh School Pack” that can be used in the classroom throughout the whole year. 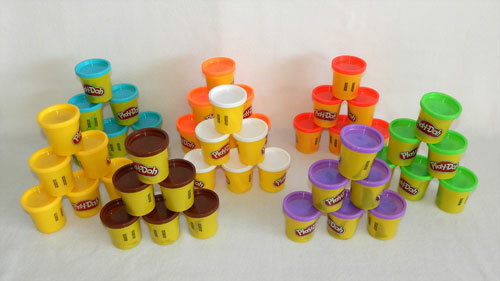 The “Play-Doh School Pack” contains 48 cans of Play-Doh in 6 sets of 8 different colours – Yellow, Blue, Brown, Orange, White, Red, Purple and Green. Each can is 84g (3oz). Learning happens in many different ways. Some children learn by reading, but many learn by doing. Play-Doh encourages hands-on exploration and learning. 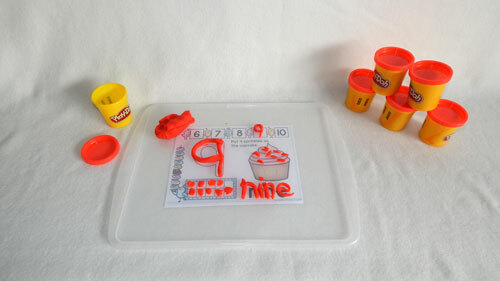 It is an excellent learning center manipulative for teaching math and literacy concepts. There are many printable Play-Doh mats online to use at learning centers One amazing resource for printable materials is Playdough to Plato. Play-Doh helps develop hand and finger strength, motor control and encourages creativity as they squish and mould the compound into shapes. The lids of the Play-Doh cans are difficult to open and close. I would like to see a more child friendly storage option. The Play-Doh is soft and pliable with bright, bold colours. If the Play-Doh dries out just add a little water, a drop at a time, to the compound and massage through until it is the right texture again. There is something magical about rolling, patting, and squishing Play-Doh with your fingers that you can’t duplicate. The “Play-Doh Classroom Pack” is sure to be a hit with teachers everywhere. *Disclosure: I received a complimentary “Play-Doh Classroom Pack” through the Amazon Vine Program. All opinions are 100% my own. This post contains affiliate links.